Dental Hygienist, R.D.H. (Glas.) G.D.C. Registration 3328. Ann has been in the dental profession for more than 20 years beginning her career as a qualified dental nurse and has worked with many of the top practices in the East of Scotland some of whom have won dental industry awards. Ann joined North Berwick Dental Centre in 2007 and brings her hygiene expertise and experience to our patients who have benefitted immensely from her periodontal skills and knowledge. 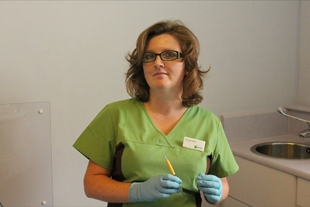 Ann’s hygiene role in our practice is pivotal to all dental care as she strives for every patient to have excellent oral hygiene skills and knowledge upon which are the core foundations for any dental treatment. Ann regularly attends conferences further afield and continuing professional development courses to keep abreast of educational and clinical developments, and changes in the field of dentistry and patient care. To make an appointment for with me for an hygiene assessment or check-up call 01620 892267.